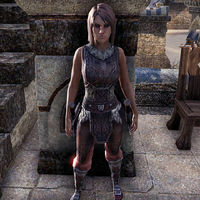 Armory Sergeant Cayliss is a Bosmer armsman who can be found in Baandari Trading Post, Bergama or Windhelm branch of the Fighters Guild. Proving the Deed: Investigate the circumstances surrounding Jofnir's death. This page was last modified on 7 January 2018, at 19:31.